The exhibit features 35 photographs, and the University Museum at Kent Hall is the first within the United States to display the entire collection. Anthropology graduate student Kayla Meyers was the one who advocated bringing this collection to NMSU. Myers was working in a domestic violence shelter in Colorado when she observed Guatemalan women coming to the shelter. “I noticed a lot of women were coming to the shelter from Guatemala as refugees who were experiencing violence. As an indigenous descendant (Shoshone tribe) I thought ‘I need to understand what’s happening,’” Myers said. 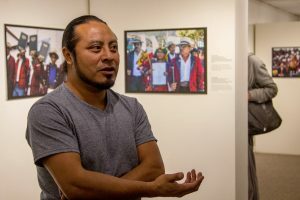 To find out what was happening in Guatemala, Myers found a job as a human rights accompanier with Network in Solidarity with the People of Guatemala (NISGUA). Here she learned about the genocide and how the people are still fighting for justice. 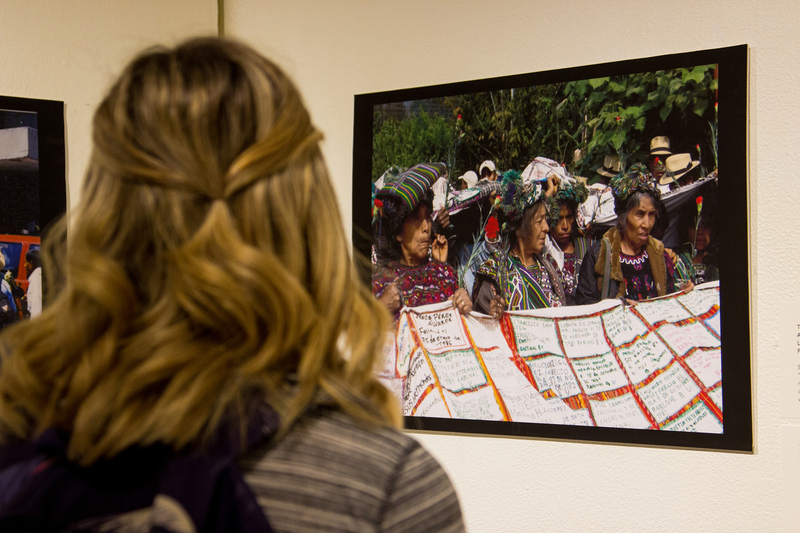 After spending a year in Guatemala, she returned to the U.S. and worked with the NISGUA organization for six months to bring this exhibit to NMSU. During the exhibit opening event, photographer Roderico Y. Diaz gave an hour-long presentation on his work and talked about living through and surviving the genocide. He also talked about the photos that are in the exhibit. Many of the pictures are of survivors holding photos or drawings of their loved ones, trying to find out what happened to them. While Diaz was talking and showing pictures, Hannah Clark, 22, left the gallery crying. “I had to leave because I started crying. It is very overwhelming. It is hard to believe that our government helped fund this genocide. It makes me angry,” Clark said. “It’s an amazing show … This is a very tough subject and I think everyone should come see it,” Davis said. Another NMSU student, Tara Delfierro, 27, seemed motivated to take action after learning about the genocide in Guatemala. “Some of the photos make me uncomfortable, but I need to not be ignorant. This show makes me want to go out and do something. It makes me think about where I am from, Hawaii, and what our government did to the people there,” Delfierro said. Diaz talked about how doing this project was dangerous and is still very dangerous within Guatemala. “I do this work to tell these people’s stories. These images I take are historical,” Diaz said. The exhibit will remain up in Kent Hall through June 30.